Those who have been reading my ramblings for a long time will be aware that I've made three visits to Taiwan in pursuit of my theme park hobby. Each trip has brought new credits, but some have remained elusive despite my best efforts; severe weather, scheduled maintenance, and even construction have conspired against me marking the island as complete in my database. After the last failure five years ago I had largely decided against a fourth attempt, as there really wasn't enough left to justify the expense of a thirteen hour flight. The country had dropped completely off my radar when my employer unexpectedly offered me the chance to spend two weeks training engineers in an office in Taipei. My first park visits of the year thus began with a two hour journey on the Taiwan High Speed Rail line, a three hundred and fifty kilometre track from Taipei Main Station to Zuoying Station on the outskirts of the southern city of Kaohsiung. I was met there by a friend who was crazy enough to fly out from England for the weekend. We hired a car for the hour-long drive to Bada Forest Paradise. Bada Forest Paradise is a combination nature park, water park, and amusement park located in Pingtung close to the south coast of Taiwan. Five years ago the place was spotlessly clean and well maintained, but today there was a definite air of neglect; the once shiny rides were faded and shabby, weeds were poking through the footpaths, and even some of the sculptures within the grounds were in need of repair. That being said, there was a lot work underway today, suggesting that the place will be restored to its former glory in the not too distant future. We had a powered coaster to tick off, and thus we headed into the amusement area with a sense of optimism that proved entirely misplaced. The ride we had come for was closed, as indicated by a weather-beaten sign on the stairway and a chain across the entrance. Closer inspection revealed a track that was covered in rust, and both of us concluded independently that this was proof of a machine that had been out of use for some time. We were left with the consolation prize of a low-budget horror walkthrough that was almost certainly designed and built in house. 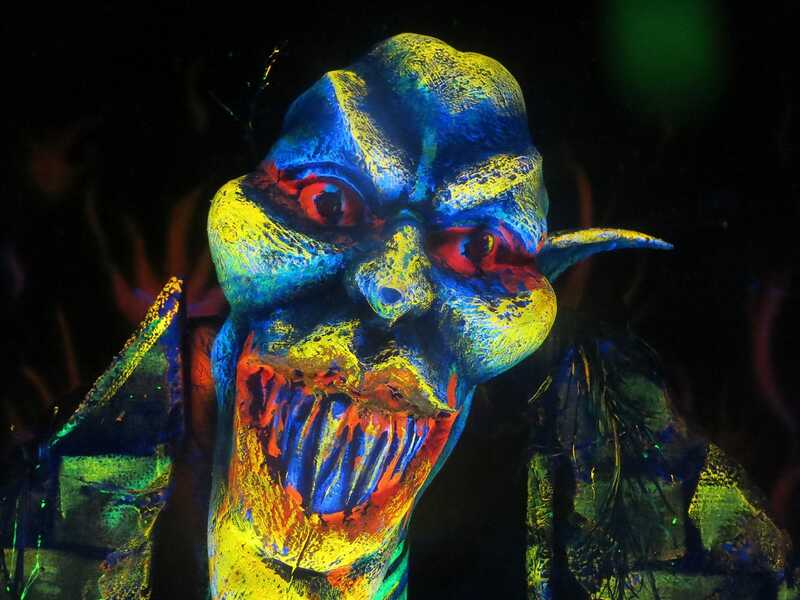 The vast majority of scenes were static painted models composed from just four luminescent colours; red, yellow, green, and blue. The uniformity of the experience made it unique, and it was hard not to be impressed by what the designers managed to do without animatronic technology. The only scene with any motion was towards the end, where the head on a monster rotated at a slow speed. The same room also had a vibrating floor section as a token special effect. We were exploring the rest of the park when the silence was shattered by the unmistakeable sound of a coaster train, and suspending disbelief, we wandered over to take a look. Sure enough Meow Meow Coaster was trundling around the track with a full complement of passengers, completely invalidating all of our earlier assumptions. It came to a halt as we watched in the general area of the station, though the front two cars had overshot. We quickly helped the operator push it back to where it was supposed to be and boarded the train ourselves. The cars tilted sideways as we climbed into them, bringing back memories of a similar ride in Mexico. Given the condition of the ride it seemed wise to try and stay centered in order to minimise stress on the wheel bogies, but this proved impossible; the train picked up speed very quickly after dispatch, resulting in strong lateral forces that pushed me to the side and held me there. We were only given one lap, though we did get to roll back and forth a few times as there were no brakes in the station. The discussion about exactly what constitutes a roller coaster is one of the most contentious topics within the enthusiast community today. Some people believe that anything that moves at speed on a track meets the definition. Others require that there be changes of direction and elevation. Still others, myself included, feel that eligible rides should complete at least a portion of their journey using potential energy and momentum. There are also a variety of different views on what the difference is between a log flume and a water coaster. One European fair promoter advertises a log flume rollercoaster, a malapropism made worse by the fact that roller coaster is two words rather than one. My own view is that water coasters must have a momentum-driven vertical climb of at least a few feet. RCDB operates a somewhat stricter definition than I do, and thus my track record includes rides like Aktium and SuperSplash that do not appear there. My girlfriend on the other hand tends to disregard some rides that are listed in RCDB but that run in a trough, and regularly teases me for counting Across Amazon. The argument over what is and isn't countable is directly relevant to enthusiasts visiting E-DA Theme Park. On my first visit to the park five years ago I noted an enormous splash ride towering over the midway, but decided to skip it as the hour-long queue in baking sunshine didn't appeal. At the time I didn't know that the layout included coaster sections, and I was surprised as anyone else was when RCDB decided to reclassify it. We arrived at E-DA shortly after lunch time, and promptly overshot the parking area for theme park guests. There was nowhere to make a convenient U-turn, so rather than backtrack we decided to search for a space in the nearby outlet mall which we knew from previous experience to have an entrance route. This approach worked, but it was definitely sub-optimal; we'd somehow managed to forget that the mall stretches almost six hundred metres from end to end, and the only spaces available on a busy Saturday afternoon were at its furthest extremity. We sheepishly walked the ten minutes or so back to where we'd started and joined the queue to purchase tickets. On the plus side, the delay meant that we had arrived at the ticket desks five minutes before a discounted afternoon price was due to kick in, and perhaps unsurprisingly the queue wasn't moving while people waited for the appointed time. 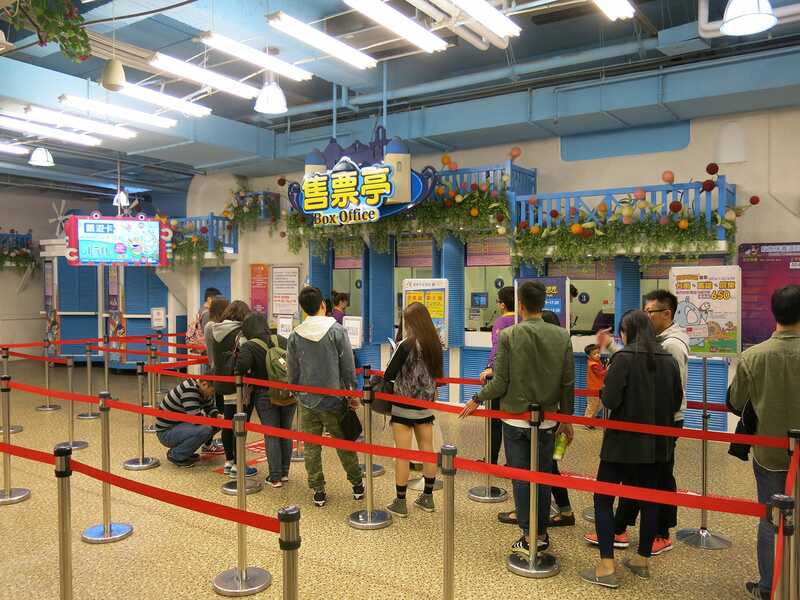 Staff opened a few extra ticket desks in order to handle the gradually expanding queue, and their efforts meant that things moved very quickly once the clock ticked over. The entrance from the mall leads into the third floor of a building with a monorail station, a restaurant, and not much else. We exited at ground level and walked roughly five minutes to the imaginatively named Flume Ride (#2191) where we found a queue of about twenty people, most of whom were wearing ponchos. We decided to follow their lead, figuring that the NTD $40 (~€1) fee would be a wise investment, and it most definitely was; the splashdown element was absolutely drenching, as a teenager sitting in front of me found out the hard way. I subsequently saw her standing in the people dryer wearing an expression of unbridled disgust. The layout of the ride can be succinctly summarised as lift hill, mid-section, lift hill, and splashdown. The mid-section features something like two hundred feet of gently sloped trough, punctuated by two V-shaped drops of about three feet and a short tunnel. The sixteen passenger boat covers this section at a speed that barely makes it into double figures, giving an experience that really doesn't feel like a coaster. That being said, it meets all of my rules, so I'm going to count it against my better judgment. We took a brief meal break before heading down two floors to the Haunted House located in the basement level of the main park building. There were no other guests in line, in sharp contrast to my last visit, allowing us to walk right in. Photographs were not allowed unfortunately, but I can say that the interior was extremely impressive, with superbly detailed theming, quality animatronics, and elaborate paintings on the walls. The scare level wasn't overly intense today, though one imagines that that is somewhat dependent on the mood of the live actors. 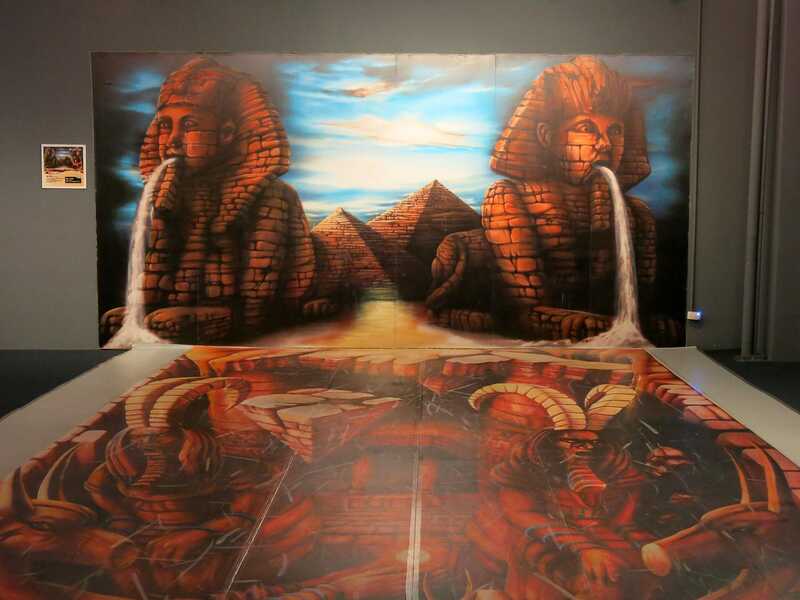 The basement level also has a strange attraction called 3D Fantasy Land, comprising a collection of large format canvas prints designed as photo opportunties. Available scenes included a set of impossible staircases, an inverted roller coaster, several monsters of indeterminate provenance, a subway car emerging from a fiery nebula, and the Egyptian pyramids pictured above. The print quality wasn't good enough for the backgrounds to be fully convincing, though in fairness small children probably wouldn't care all that much! I'd been very much looking forward to renewing my acquaintance with Dark Ride, an enclosed custom roller skater with a lift hill at the end of its layout. In an ideal world I'd have completed a few laps, but I quickly gave up on that idea when it became apparent that the operators were working to a dispatch interval of one train every fifteen minutes, causing an entirely unnecessary three quarter hour wait. I'm generally happy to support parks that wait for all seats on a coaster to be full, provided that a sensible time limit is in place, but there is absolutely no excuse for deliberately slow operations when paying guests are in a queue. On the plus side, the on-board experience was just as good as I remembered, thanks to smooth tracking and close encounters with theme elements. 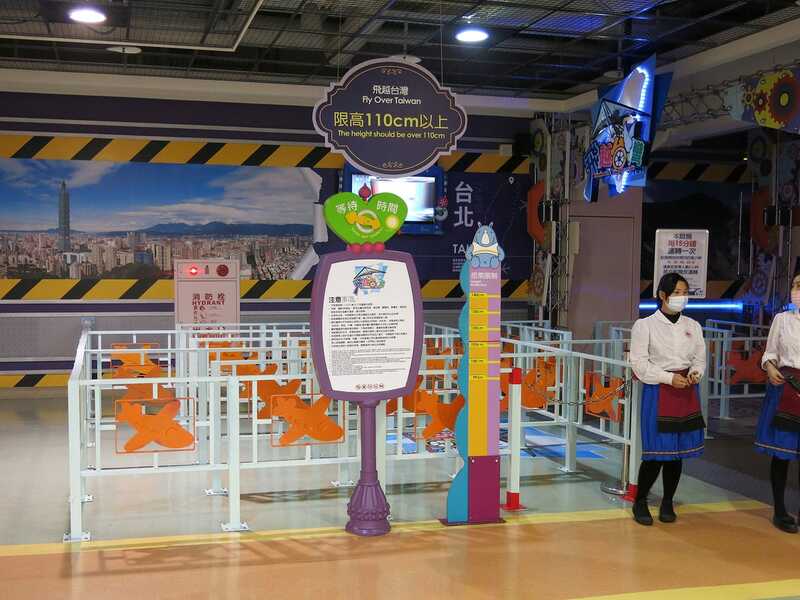 Our next stop was at Fly Over Taiwan, a knock-off of the Disney Soarin' ride following in the footsteps of both Adlabs Imagica and Busch Gardens Williamsburg. This version wasn't one of the better ones, due to a jerky motion system and a projector with a serious fisheye problem. Landscape scenes were not impacted too badly, but the cities we passed had curved skyscrapers that looked very silly indeed. The video also included subtitles at the bottom of the screen that didn't do the flying effect any favours. We hadn't planned to ride Rooftop Junior Coaster, but we decided that we might as well give it a go given that there was no wait time as we walked past it. We were rewarded with what was without question the best ride I've ever had on a Fabbri-built coaster; the track was negotiated without any jarring, and the car spun at an incredible rate, pinning us into our seats and delivering a thrill factor well beyond the norm for this design. The last stop of the day was at Big Air, the U-shaped coaster from Vekoma with cars designed to rotate slowly while held high in the sky by a catch car mechanism. Sadly this feature was deactivated by park maintenance some years ago, neutering the ride and turning it into little more than an oversized butterfly. It would still have been fun in its reduced state were it not for the brutal slam that occurred every time the car transitioned between horizontal and vertical. The experience was not pleasant at all, and probably explains why we had to wait almost ten minutes to assemble the eight passengers required to run the ride.